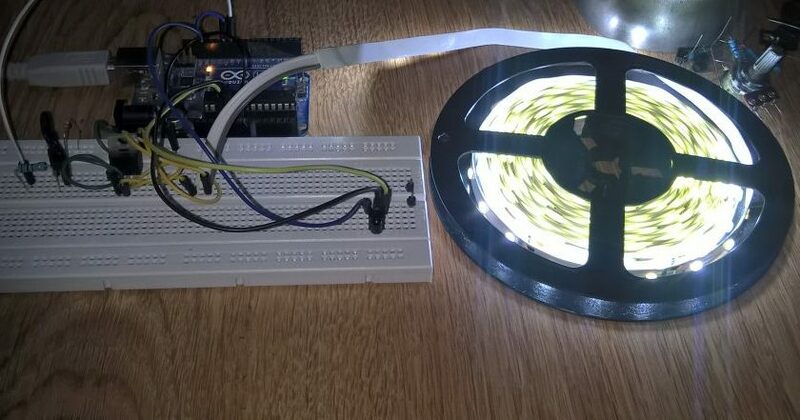 As you can see in last two post about sine waves (How to generate a sine wave from arduino or atmega 328 and How to generate two phase sine waves with arduino) is not as hard as you think to generate such signals so, in this post i will generate three phase sine wave signals at 120 degrees phase shift. 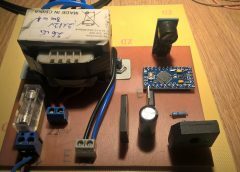 Because arduino uno has three timers and one of them is used for interrupt it can not be used anymore so i have used an arduino mega. 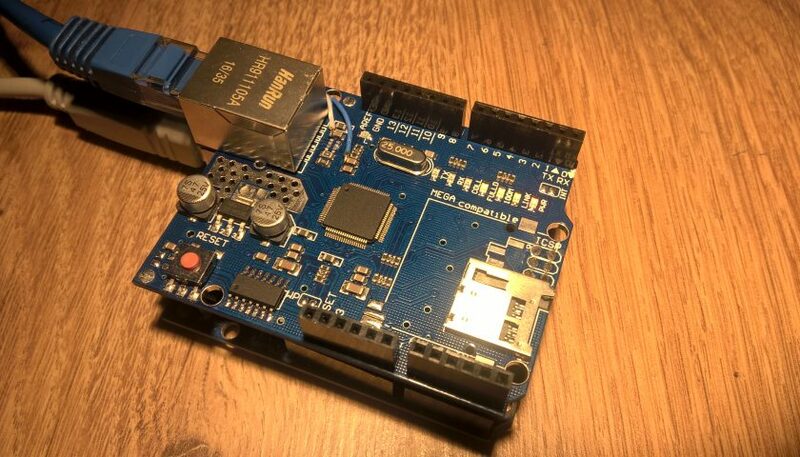 Arduino mega has an atmega 2560 onboard with five timers and 15 pwm capable pins. 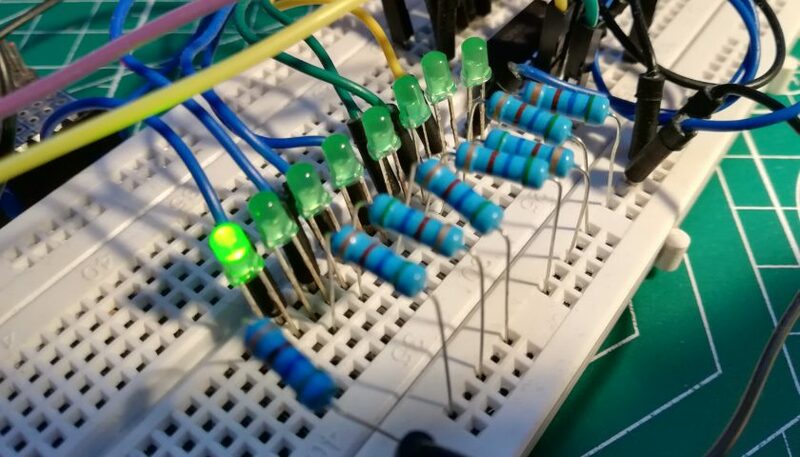 As you can see in the previous post with two phase, if for 180 degrees we have 314 elements , for 120 degrees we have 209 elements so the second signal must start when the first is at 209 pulse and the third must start when the second is at 209 pulse. So, when the program starts, the interrupt is enabled and first is executed the first signal part(with element i). When i take the 209 value the second signal is enabled(with element j). When j take the 209 value the third signal is enabled. In this way these three signal are at 120 degrees phase shift. When “i” has 209th value the “if” function is enabled and everything in it is executed. To mantain the execution of that part for the second signal after the value of i(209) is changed we use a variable which enables the “if” function continuously. In this case, the third signal is enabled when “j” (the element for the second signal) has the 209th value. After that, the “if” function is executed like for the second signal. 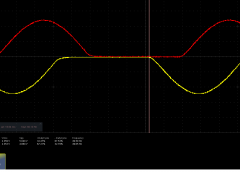 Because i have an oscilloscope with only two channels, next i will present these signals in pairs. 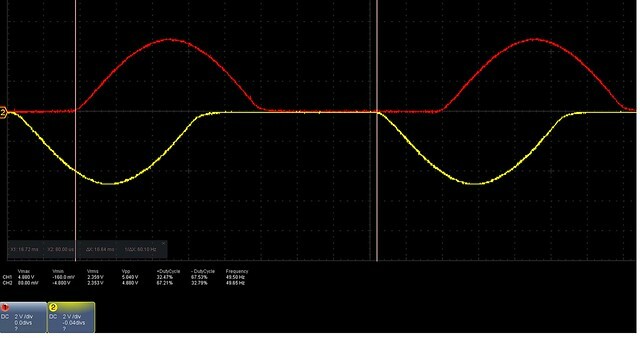 Some signals will be inverted from the oscilloscope software to simulate like they are driving a H bridge on the negative half duty cycle, but reported to arduino GND they still have 5 V.
As you can see in the picture above i have used Timer 0 for first signal, Timer 2 for the second and Timer 3 for the third. First let’s see the first signal. 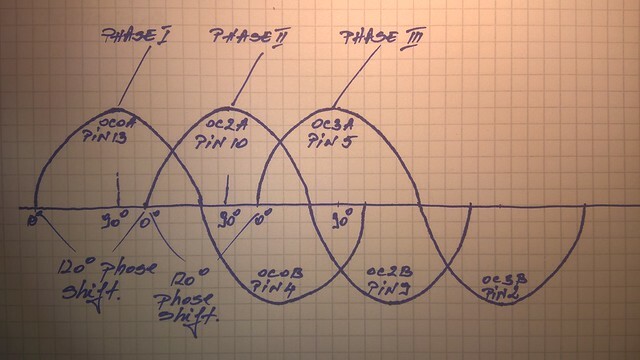 For that we use OC0A and OC0B pins(13 and 4). 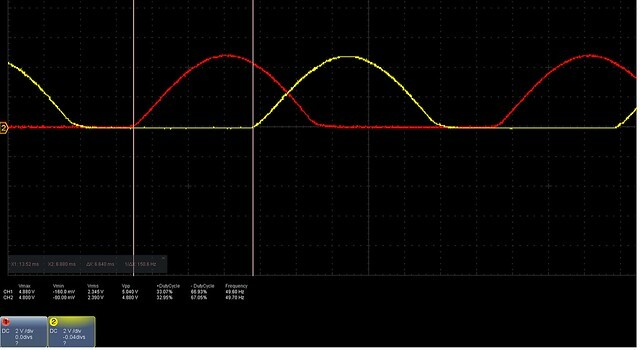 On the oscilloscope, the negative half duty cycle(from pin 4) is inverted in order to appear like a negative half duty cycle. 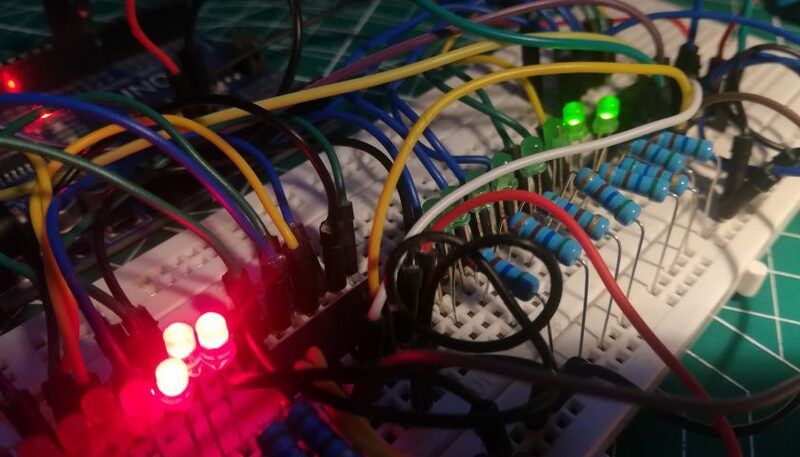 The red signal is from pin 13 OCR0A and the yelow one from pin 10. 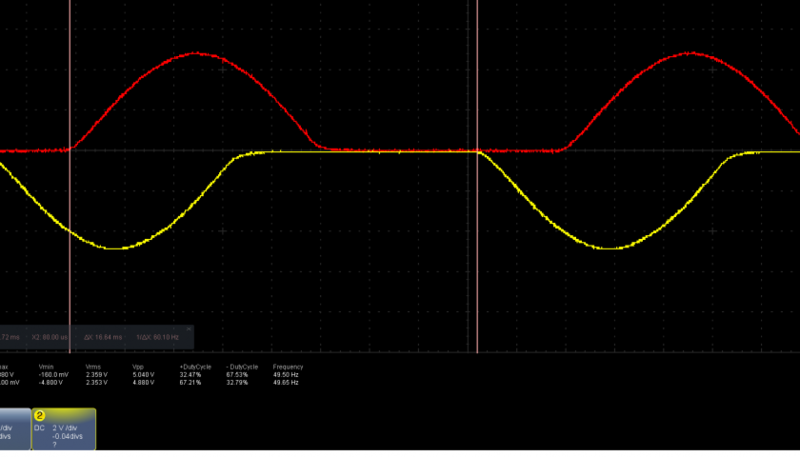 The time delay between them is 6 .640 ms, almost like 6.66 for 120 degrees phase shift. 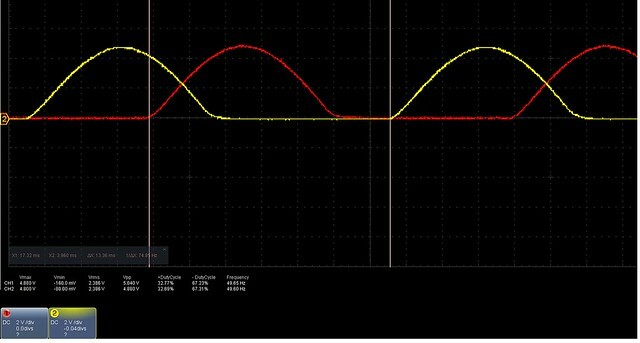 The time delay between the start of the positive duty cycle of the first signal and the negative of the second signal is 16.64ms. 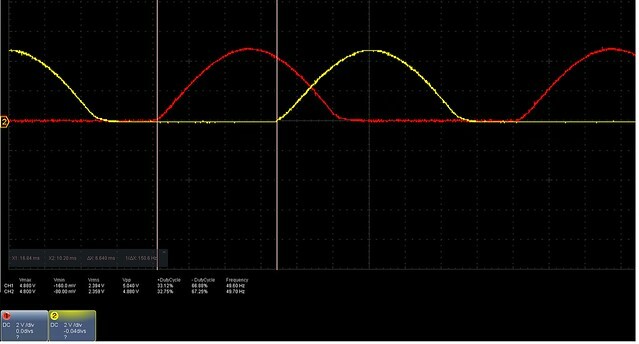 These 16.64ms results from the 6.64ms delay between positive half duty cycles of the first signal and the positive of the second and 10 ms for one half duty cycle(50Hz signal). 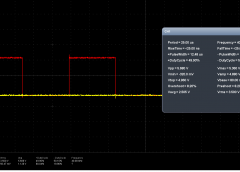 Time delay between these two is 13.36 ms almost 13.32 for 240 degrees phase shift. The results are identical with the results between signal 1 and signal 2 also with 6.640ms delay. I understand that you are generating a square wave with a duty cycle corresponding to a sine curve (in fact 3 square waves with a 120 degrees phase shift). As far as I can see, the amplitude of these square waves is 5V. What I don’t understand is how you make sinus curves from these square waves. 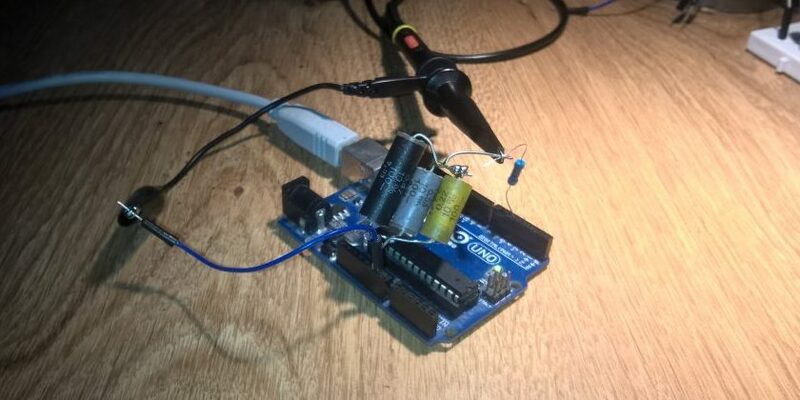 Hi sir, do you think this code could work for my arduino uno? 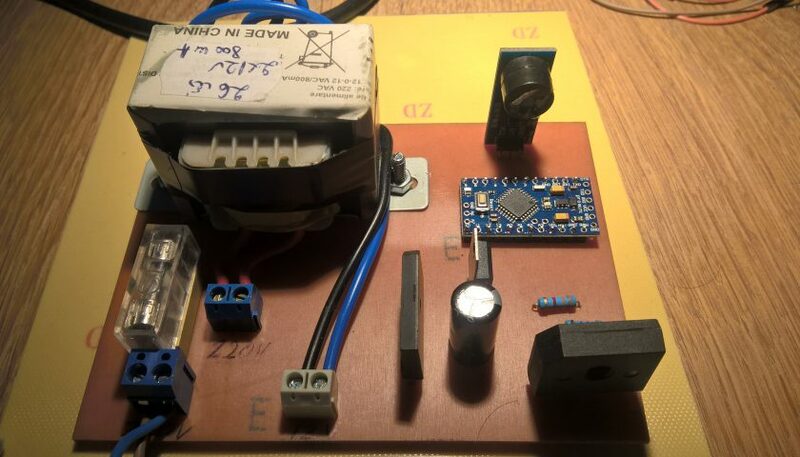 My project is a 3ph pwm inverter using PC817 optocoupler with a IR2112 as a driver and i was trying to make it work with pins 2,3,4,5,6,7 as an outputs but i have no good results, so my question is if i can use your code in this project? Guy you are some of a kind, i say thank you from my heart for this code, i will work on this immediately it is for a good cause project. 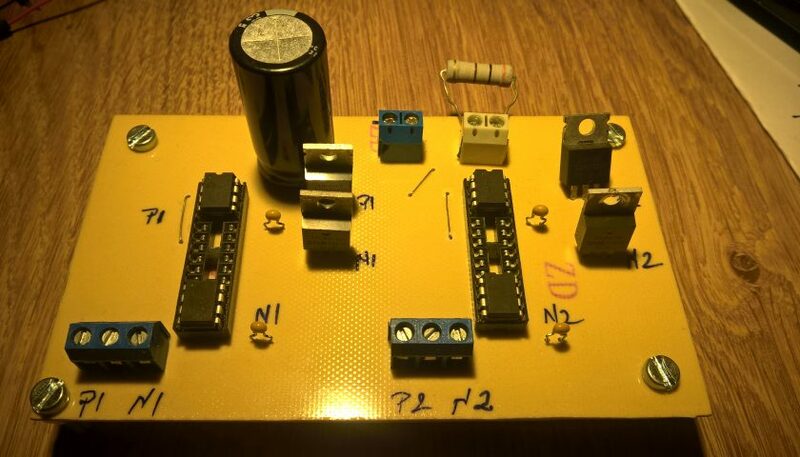 Hi,i made some testings and it looks the transistor gate voltage is not enough so i will rise the voltage and see how it works.